Welcome to Fantasy Football Tips Gameweek 34. 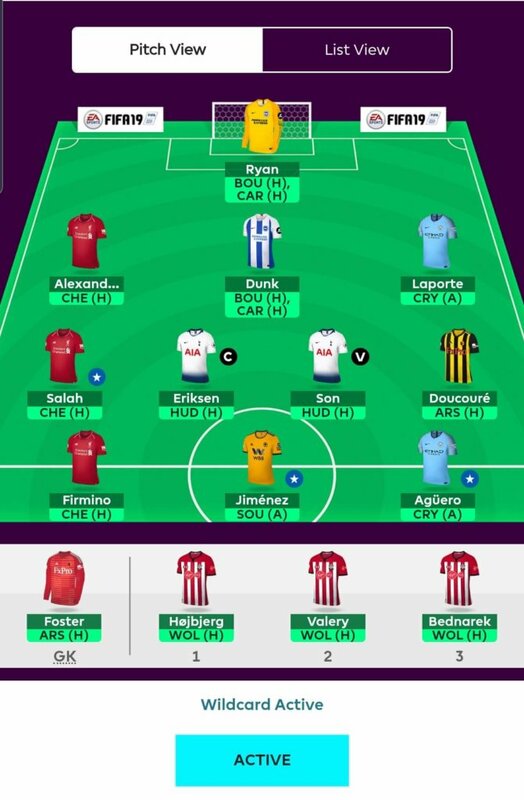 Hello everyone and again it is upon yours truly to try to get you the best possible tips for the next few weeks of FPL. Alas as well, I have activated my own wildcard this week (immediately as the ‘new’ Game-week opened in fact) and I now have a platform to talk about it which is both a pleasure and cathartic. So rather than waffle on about everyone who has potential to be in an article – and also for the fact that I can’t be bothered coming up and researching statistics on copious amounts of players which is too much like hard work – I thought I would fully disclose my wildcard selections in the form of this week’s article. After all, each time when writing a Tips article, I’m really looking at it through the prism of naming about 10-15 ideal players which is in effect a wildcard, or so at least I thought anyway. Therefore, I have given you below my (current) selection and a special mention to a couple of alternate players for each of the positions. Those who were close to my consideration and who I would probably default to if any of my first choices fall victim to injury between now and the deadline bell sounding. Should I completely rip up this draft and go with something else, I will announce on site if any of you are interested but I’m starting to think that I must settle at some point* and these players have been researched a little and ‘hunched’ a lot, so I can justify them at least to myself! *Before every FPL relevant player started dropping like flies with injuries this midweek. Mat Ryan, the Brighton goalkeeper is in due to his nice cheap price and the double double gameweeks ahead for the Seagulls. Brighton have six clean sheets with FIVE of those coming at home. 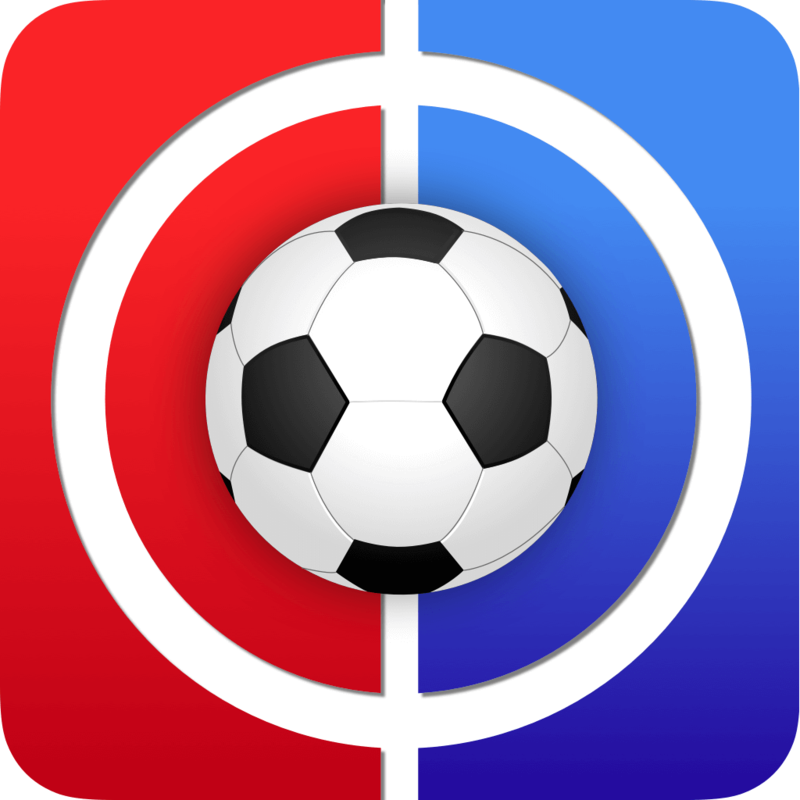 The opposition for the DGW34 are Bournemouth and Cardiff and as luck would have it, they are both at home! After that the Aussie and his mates play another DGW in Gameweek 35 (where I’ll use Bench Boost) but these are both away at Wolves and Spurs. After this Brighton entertain Newcastle and then with Arsenal and Manchester City to see out the season, there is a case to say that things may go quickly south after this coming gameweek. 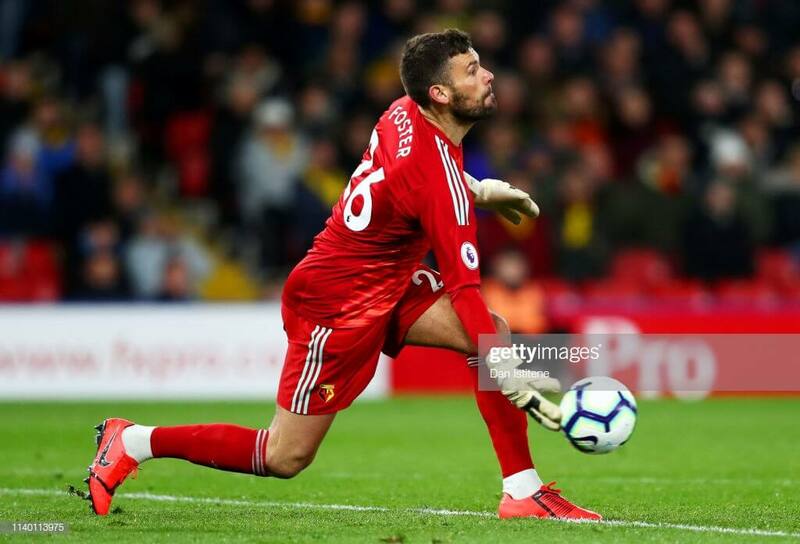 Ben Foster appears to be the most assured of the Watford defensive unit as there are so many alternatives and injury doubts ahead of him. The ex-England goalkeeper should play the remaining league games as Heurelho Gomes is the Cup goalkeeper for the ‘Orns. I’m taking Foster here as I want Watford coverage for their remaining matches against Huddersfield and Southampton during the DGW and for matches against Wolves and West Ham where I hope they add to their 7 clean sheets so far. Back-up: Angus Gunn is excellent value at just £4.3mln and Southampton do have some fair fixtures until the end of the season. Combining him with one of the Southampton defenders of Yan Valery (£4.1) and Jan Bednarek (£4.0) is very cheap double coverage for just £8.3mln which makes sense if every penny is a prisoner and you have a Bench Boost chip to utilise. 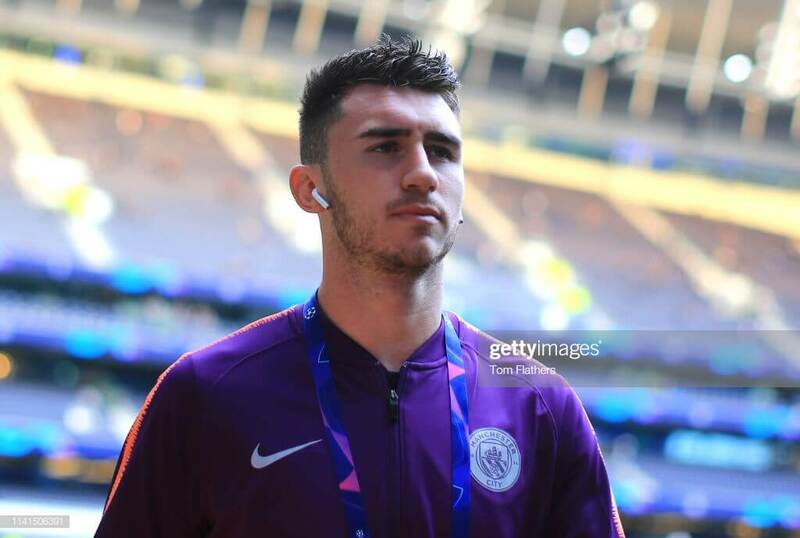 Aymeric Laporte is my Manchester City defender of choice and this is due to him playing as many minutes as any other and his two goals and two assists. Whether he keeps clean sheets in the DGW (Spurs and United) to really justify his inclusion at £6.0mln is one decision I am swithering on but he is in the squad just now. Trent Alexander-Arnold is a big favourite of mine and the first of three Single gameweeker’s in my squad and unsurprisingly, all are Liverpool players. Too often and I speak from experience, the lure of the DGW is a false one. Plenty of times a SGW player has outperformed someone on a double and TAA is one who I think always looks to have a goal-scoring and assist potential in him. Assists for instance – he has SEVEN of those bad boys so far. Cardiff, Huddersfield and Newcastle are probably the three you would handpick when looking for a clean sheet. Liverpool play all of these in the remaining weeks. Lewis Dunk should really be Shane Duffy as the Irishman appears to score goals whereas Dunk does too it’s just they happen to be own goals mostly. I believe it to be the great philosopher Cookie who once said ‘you get what you pay for dontcha’ (or similar). As mentioned above Brighton have four games in the next two Gameweeks and therefore this is one area where you are getting four free ‘hits’ at FPL points so I would like to have two – three to me is stretching – of their players in the back line and cross fingers for more of their dogged defensive displays amongst these. I’d happily take four 0-0 draws! Brighton are about 7 points away from safety I think basing this on nothing more than the magical 40-point safety mark and the fact there is only one spot to play for and you just have to better Cardiff. Yan Valery and Jan Bednarek both find their way in to my wildcard team for a few reasons. Firstly, as mentioned they are not costly coming in at £8.0mln for me (I already have Bednarek at £3.9mln). Secondly, they are reliable and appear to be set in stone in this current Southampton system as they have both played virtually every minute since GW26. Third point is their fixtures ahead as the Saints have six winnable games to go at home to Wolves, Bournemouth and Huddersfield mixed in with trips to Newcastle, Watford and West Ham. Finally, I believe both of these players to be sustainable for the remainder of the season even if I don’t choose to use both in any given week. I’m convinced they will be reliable bench players to call upon if needed whilst I focus my free transfers on more exciting and rewarding areas of my squad. Back-ups: Kiko Femenia (Watford) should be good value at £4.2mln if he is declared fit and Matt Doherty is the Wolves pick who you really should go for if the cash is in your pocket. The Irishman has three goals and six assists this season meaning he’s been snapped up by so many managers that he has risen almost £1.0mln in transfer value since the beginning of the season. Ryan Bennett is far from the most exciting member of Wolves squad but needs must at times and the ex-Norwich defender is probably trusted to play both Wolves games in the DGW. He completed 90 minutes on his return from suspension in the league match against Manchester United and despite not featuring in the FA Cup semi-final defeat, I see Nuno relying on him being a steady part of that three-man central defence for Wolves. Another no-frills value pick in my book. Mohamed Salah has finally reached the 50-goal mark for Liverpool and he rang this up in the victory at Southampton last Friday. That to me was all I needed to see. Listen, he is still an absolute top act and he is in here for reasons that I don’t really have to go in to do I? Well, one of them is the fact that in all likelihood my Triple Captain chip will be on him in GW36 as the Reds host Huddersfield on the Friday evening. Oh yeah, he also has Cardiff and Newcastle as well. Three hat-tricks across these would be mightily fine. No qualms about using him this week at home to Chelsea either. 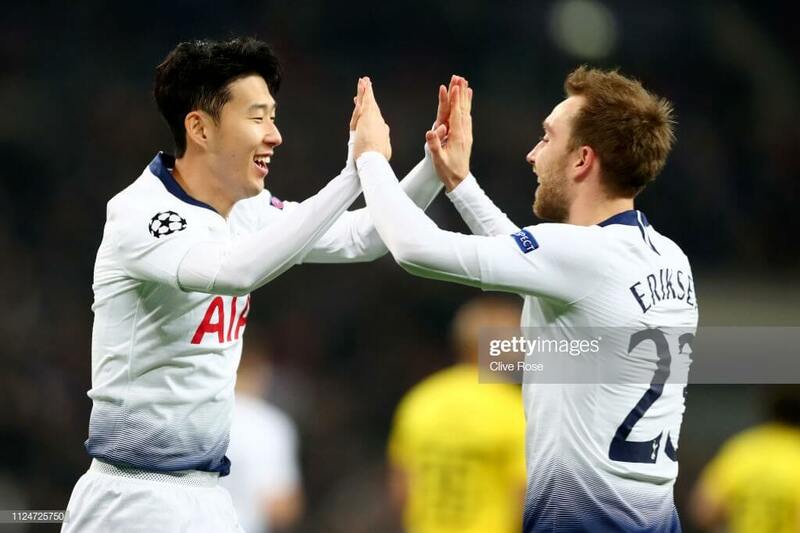 Christian Eriksen and Heung-Min Son are going to be my Spurs double act for this weekend and beyond. Kane is out and even if he isn’t ruled out officially, you can’t take the chance on him short term. So, I had to rethink what I wanted to do. The Lilywhites have Huddersfield this weekend so there’s your obvious urgency for their players! I can see this week’s captaincy going on one of these boys. I can’t take great risks on this WC so therefore I immediately ruled out Llorente and Moura as I can’t be sure they’ll play as many minutes as Eriksen and Son. Son has already scored goals in each of the games in their new stadium already and he has four more opportunities in the remaining weeks to carry on here. The Dane Eriksen has had a comparatively disappointing season so far by his own high standards with just six goals and 11 assists to date. With set plays in his repertoire and corners, there will be more assists to come. Looking at the remaining fixtures it should only be Manchester City standing between Spurs’ hopes of a top-four finish in both the Premier League and the Champions League! Abdoulaye Doucoure is in because *spoiler alert* Raul Jimenez is in. I was between Doucoure and Jimenez OR Jota and Deeney and the former just felt better although I admit that this was a close one. Maybe you guys can tell me what you think in the comments? The numbers of combined goals and assists are 17 Goals & 16 Assists (Doucoure & Jimenez) versus 16 Goals & 12 Assists (Jota & Deeney). Therefore statistically, I was right! 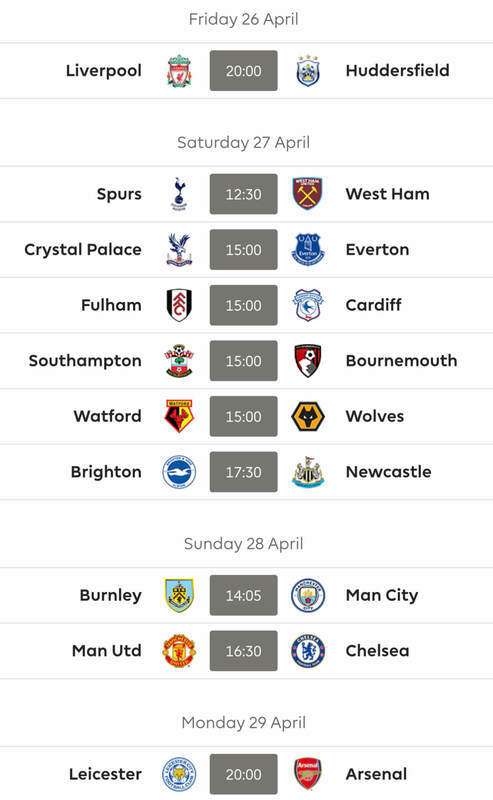 Each have a DGW and broadly speaking the fixtures are decent for both including a re-match of their FA Cup Semi-Final in GW36. Also, in the run-in, one plays Huddersfield (Doucoure) and one plays Fulham (Jimenez) so that can’t be a bad thing. Pierre-Emile Hojbjerg looks too good for Southampton in my book. I think he has put in some fantastic performances this season and he has looked better every time I’ve watched him. Calling it, I think he’ll move to bigger things in due course. The base he and Romeu provide Southampton is something to build on. Now it is time for Hasenhuttl to go out and buy some attackers to play in front of them. A ‘Shane Long’ is still a thing? Sorry, PEH has four goals (knows how to hit a shot) and 2 assists which isn’t bad for a player who doesn’t play in an advanced position but gets into them, and costs just £4.4mln. He has a DGW which I’ll need when I play by Bench Boost and is a very capable back-up which appears to be a theme developing with my Southampton players. Back-up: As above, Diogo Jota would be my go-to mid-priced midfielder and if something happens to a big-hitter I would be stretching to Raheem Sterling I think. Sadio Mane could also be considered ahead of Cardiff and Huddersfield but that would be problematic for me as I have three Liverpool already so unless it was a direct swap for an injured Salah (blame me when it happens!) then I can’t really get him. Polite notice; Eden Hazard is now just one point behind Mohamed Salah as the top point-scoring player in this year’s game – I’m thinking about him. Sergio Aguero will be my Manchester City attacking outlet. I see him playing and starting most of City’s games and despite his penalty miss in Europe this week, he’ll be back on the goal trail very soon. The current top scorer in the league and interestingly, he has the ‘best minutes per goal’ ratio in the league (105 minutes between goals, Aubameyang is next best with 134 minutes). Don’t ask me why because I don’t have the answer but I just fancy him more than Sterling for my City cover. 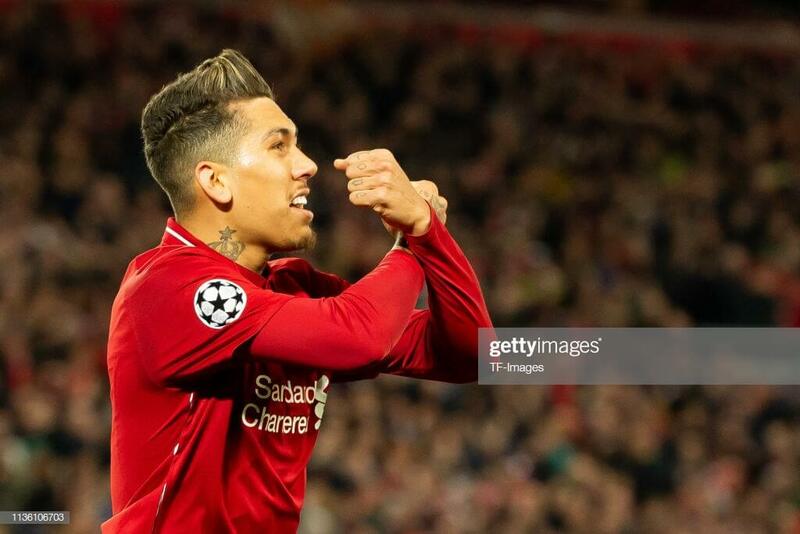 Roberto Firmino is one of my favourite players in the league and in total fairness, I usually do well when I select him for FPL as well. He’s in my post-WC team ahead of the Liverpool run-in ALTHOUGH, I am considering delaying this move by one week and having a one-week punt on another striker, most likely Jamie Vardy at home to Newcastle, and then bringing Bobby in for Cardiff. He’s had 20 goal involvements this season and has only four strikers ahead of him at the top of the charts. He will likely overtake Harry Kane in fourth soon and could well catch Jimenez and Aubameyang. Raul Jimenez – see under Abdoulaye Doucoure for the reasoning for this one but a quick mention for him as being the star of FPL 2018/19 for me. Starting on loan at Wolves and worth just £5.5mln in FPL he has now become a permanent signing at Molineux and will cost you £6.8mln if buying fresh this week. The Mexican will be about £8.5mln in FPL next year thanks to his contribution of 12 goals, 10 assists and 30 bonus points. Not too late to get on him this season though. He’s my 15th man (in this list only). Back-up: Troy Deeney will be my back-up if something happens to Jimenez and can only really consider him worthy at that price bracket. Not much else of interest to me. Marcus Rashford against Huddersfield in GW37 is however bookmarked. This is one perhaps aimed at those who will be bringing in Troy Deeney or Raul Jimenez for the DGW but with potentially tricky fixtures for this pair this week, perhaps are fancying a little punt on an outsider before the big DGW arrives. 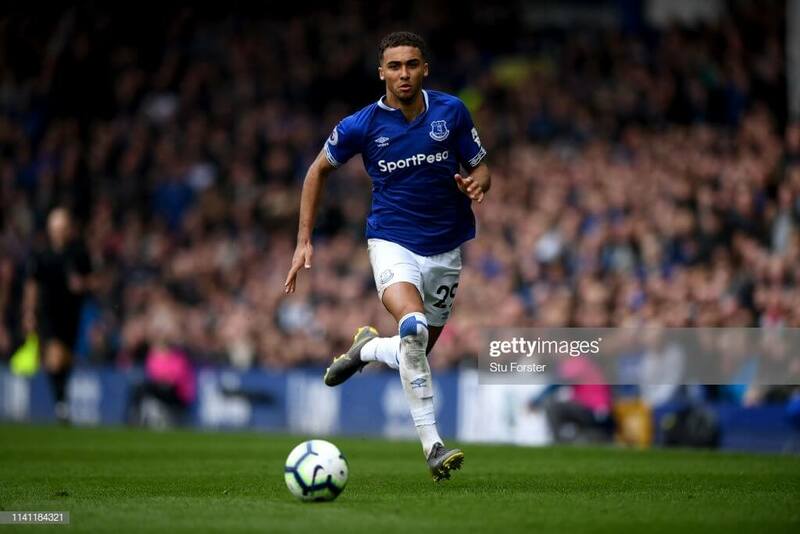 Dominic Calvert-Lewin, the Everton striker, has returned attacking points in five of his last six matches and this week should be leading the line for a Blues side aiming for a seventh-place finish as they travel to a Fulham ‘team’ who are still every bit as porous in defence as they have been all season. That was my penultimate article of the season as I believe I am due to write again on Gameweek 38 which is obviously the final week of the season. In the four weeks between now and then I think like many, I will have used up my Wildcard, Bench Boost and Triple Captain chips and would be very disappointed if I did not make a huge advance up the Overall Rankings. If you are setting a target, make sure it is a realistic one and try to give yourself a nice ‘end to the season boost’ in the run-in. If not, I’ll be here in Gameweek 38 to tell you who to bring in for a 32-point hit! Thanks for reading Fantasy Football Tips Gameweek 34. This article was written by GP. Nice article GP. I have many of those players. I am struggling with having 3 Liverpool players with the game against Chelsea. I dont see as many in most team sheets. Having the same issue. I think I’m just going to bring Mane and Salah in for GW36. Same, I’ve got Robertson, Salah and Mane rn. Think I’m replacing Mane at least. Right, I think this is it. Any thoughts or abuse about these quality selections are more than welcome. Eriksen and Sterling will become Salah and Mane for 36. It’s 0.0 in the bank after those moves, so fingers crossed for no price rises! I thought about having Sterling instead of Salah (I have Aguero). What worries me is one or both of them being rested for next week’s CL. They certainly have other players who can beat CRY…so it would be a big concern for me. I tip my hat to you GP. Some great reasoning behind your picks. I currently have 9 of the above. I haven’t changed anyone in it yet and will just roll with it. Feel as comfortable with it as I’m going to so let’s not fret about it eh?